Todd Phillips' Joker is currently filming around New York City and a wealth of set photos and videos have been leaked over the past few weeks. A new set photo gives some potential details to the storyline. Since production just started on the film, many were curious as to why Phillips shared the first official look at Joaquin Phoenix in and out of the clown makeup so soon. It now appears that the director knew that the paparazzi would be able to score a bunch of pictures, so he beat them to the punch. The latest set of Joker set images shows off the subway mayhem that was leaked over the weekend and even features a Gotham Post newspaper front page. The fictional article has the title that reads, "Masked Bandits Steal Collection Box," and details the robbery of a local Gotham City church. It is believed that the "masked bandits" are the Joker and his gang. Adding to that theory is video of Joaquin Phoenix's Clown Prince of Crime casually walking off of a subway train and removing a clown mask. The newspaper headline and the subway scene shots seem to indicate that there is going to be a power struggle in Joker over distribution of wealth in Gotham City. In the subway pictures, there's people with various different clown makeup and or masks holding up handmade signs that say, "Eat the Rich," "Blame Wayne," "Tax the Wealthy to Feed the Needy," amongst other things. Wayne Manor is a symbol of wealth in Gotham, so it makes sense that the mob would take aim at Thomas Wayne. Going into speculation territory, we could see a twisted version of Robin Hood in Todd Phillips' Joker. Joaquin Phoenix and his gang could be starting a public outcry in order to rob from the rich to feed the poor, or even see the villain want to keep the money to himself. It's not clear what the specific storyline will be, but Phoenix has indicated in the past that the film is going to be a character study of the Joker, and that it will be unlike anything we've seen in the superhero genre thus far. It's going to be very interesting to see what Todd Phillips and Joaquin Phoenix create with Joker, especially with the release of all of the new set photos. When the movie was first announced, DC fans were very skeptical of what the studio was trying to do with bringing another version of the Joker to the big screen. However, as time has gone by and we've gotten a closer look at some of the action, that skepticism has turned into intrigue. Joker doesn't hit theaters until next fall, but you can see some of the set photos below, as well as some video, thanks to The Evening Standard U.K. 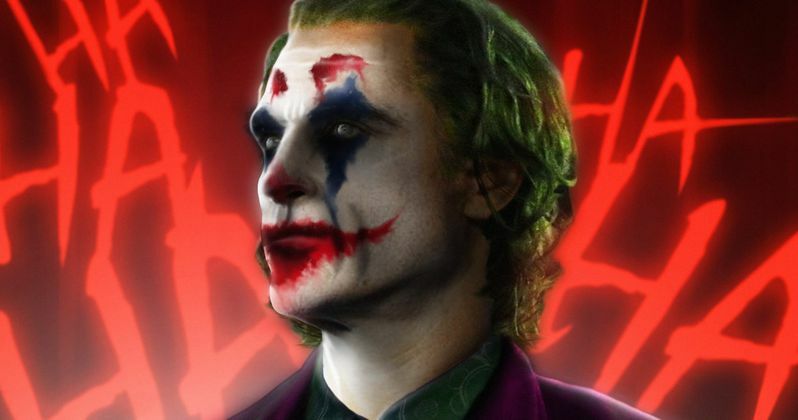 Check out these set images confirming #Joker's look in full-makeup!